Hong Kong, known as shoppers’ paradise, has amazing skyscrapers and is a combination of different cultures with much to do and see. 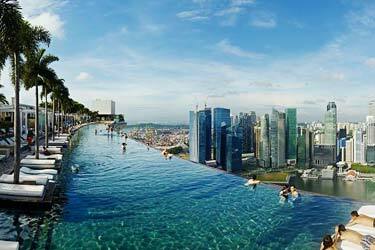 The best way to view the entire city at once is from its rooftops and if there is a crisp infinity swimming pool on it, it is a bonus that can help you stay cool in the hot summer. 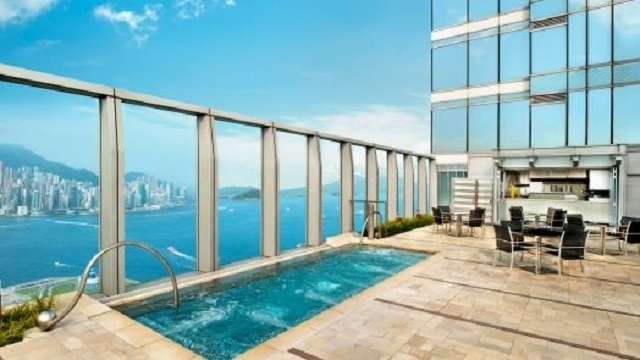 Here’s a list of the best rooftop pools in Hong Kong located at hotels. 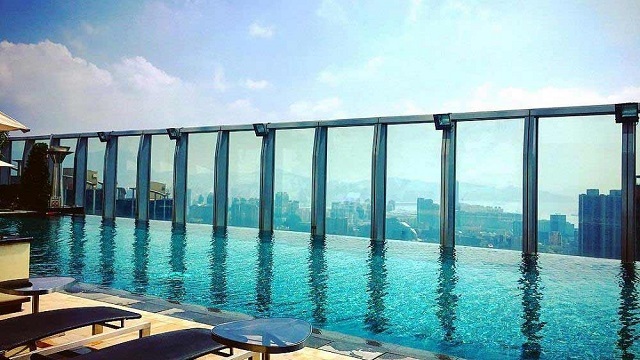 This rooftop pool is known to be the highest swimming pool in the world as the pool in located on the 76th floor which gives you the ultimate view of Hong Kong. 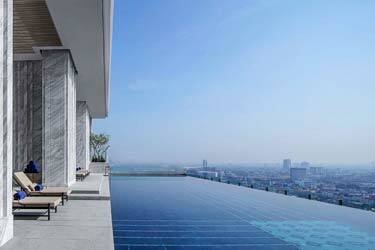 The pool itself is stylishly designed with an infinity edge while the ambiance makes this rooftop a big attraction for guests. After swimming, deckchairs for sunbathing, cocktails on order, a bite to eat and high-speed internet connection will keep you well entertained. 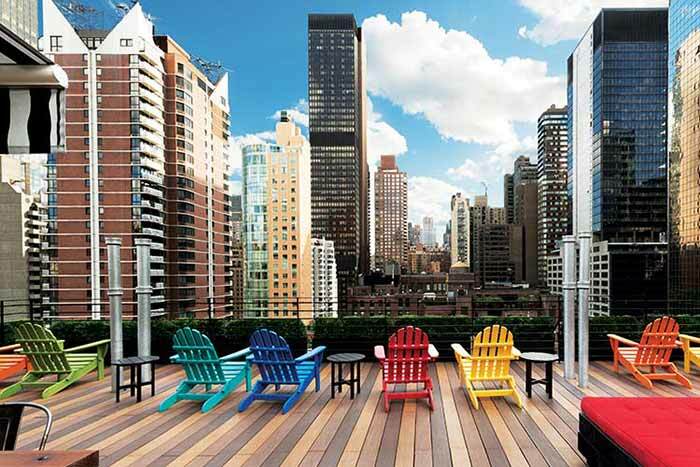 You do not need to be a hotel guest to enjoy the amazing view as outsiders can access the pool every weekend during the summer. 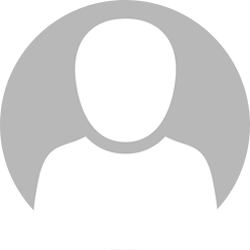 To give you a better idea of the service quality of the hotel is by explaining the name. The "W" stands for the pool area being "wet", the business center being "wired" and the front desk service will help you with "whatever, whenever". 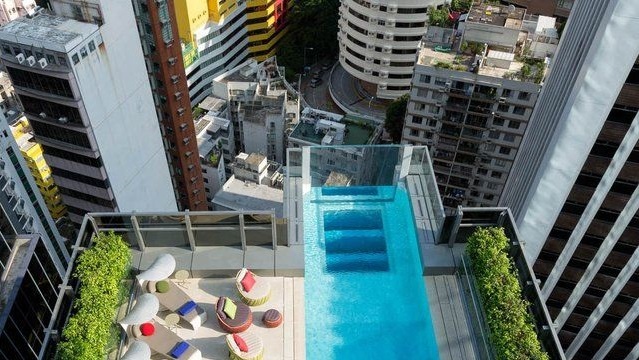 The inside of this hotel, which is located in the utmost urban area in Hong Kong, resembles the local feel together with its slickness. 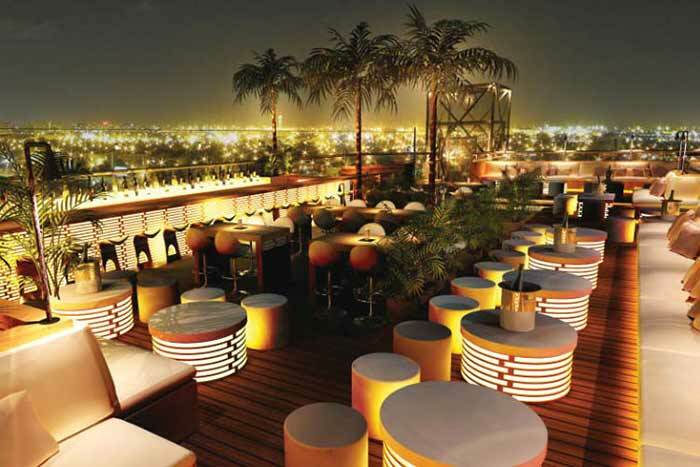 This hotel brings the same urban feel to its guest when they set foot inside, adding a slick and stylish vibe. 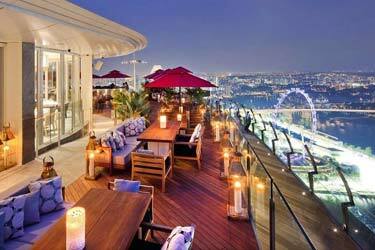 When entering the bright hotel lobby you do not feel like you are moving away from the outside and when going up to the 29th floor you get the chance to experience the urban city from a higher view. 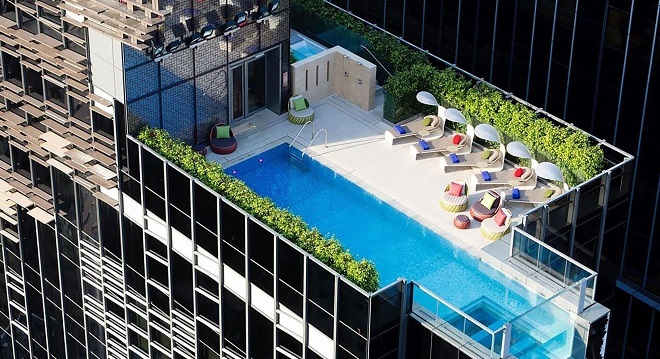 This rooftop area might be a bit small, but you can enjoy a drink at the bar or go cool off in the glass bottom swimming pool. 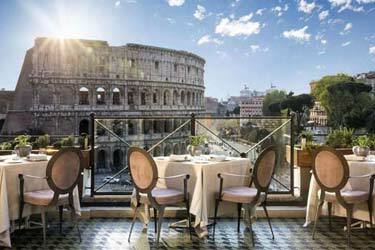 For an outside terrace dining experience, the Indicolite restaurant offers all day dining. 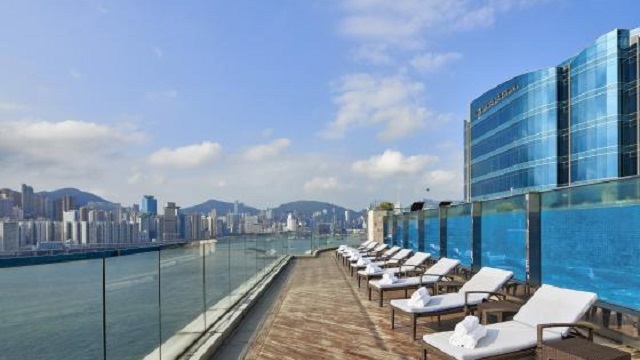 In the Whampoa Garden district, you can enjoy the view of the harbor from the breezy rooftop of the Harbour Grand Kowloon. 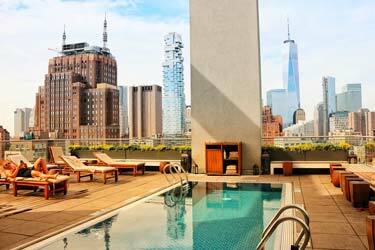 This rooftop has a spacious infinity pool where you can cool off after an exhausting day in the city. 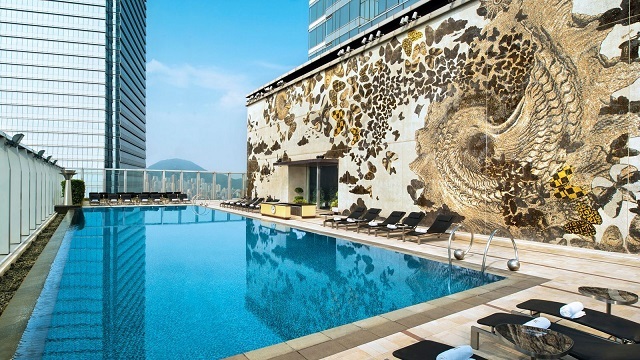 The unique glass-walled pool is surrounded by comfortable chaise lounges together with a whirlpool and a bar to ensure complete relaxation. 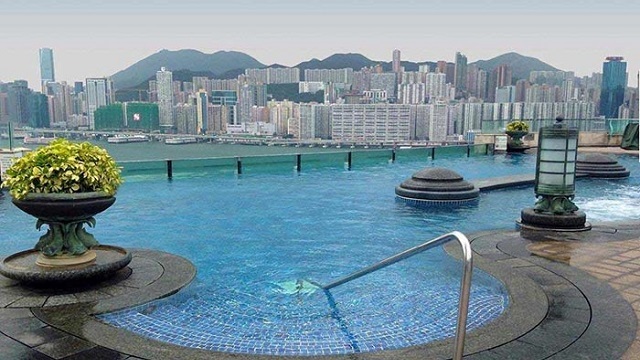 The pool area is located on the 21st floor and the opening hours for guest are between 8:00 and 19:00 in the winter and 7:00 and 22:00 in the summer. 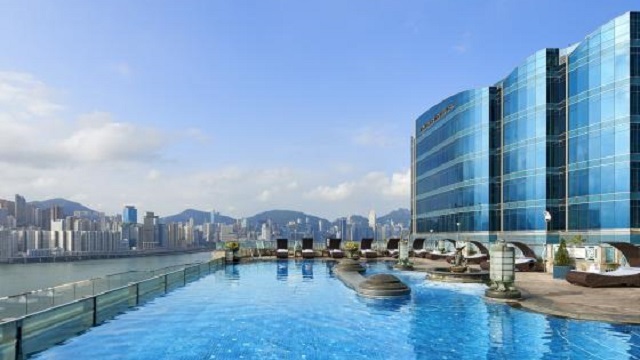 Located in Kowloon, this hotel's main selling point is its swimming pool located on the rooftop. 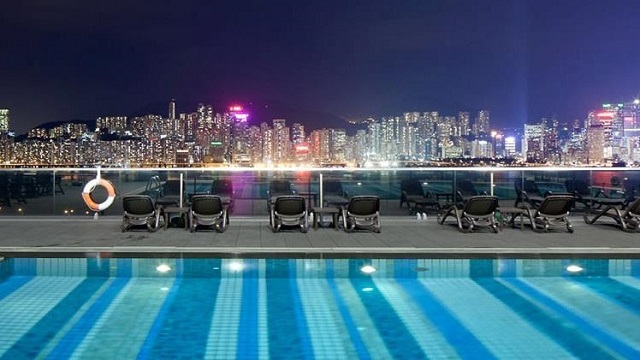 The view you will get here is of Hong Kongs' harbor and skyline. 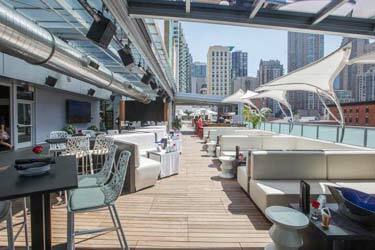 Part of the rooftop area is shaded that allows time for lounging while having drinks served from the Violet Bar. 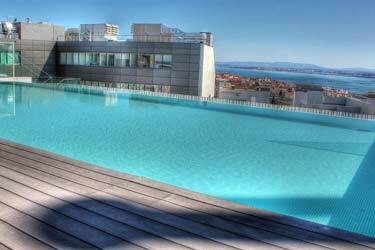 The pool is heated and is located on the 9th floor with opening hours being from 06:00 - 21:30. If swimming and relaxing in the sun or shade is not your thing, you can always choose to stay in shape as they offer a fitness area with free machines and weights which are open 24 hours. 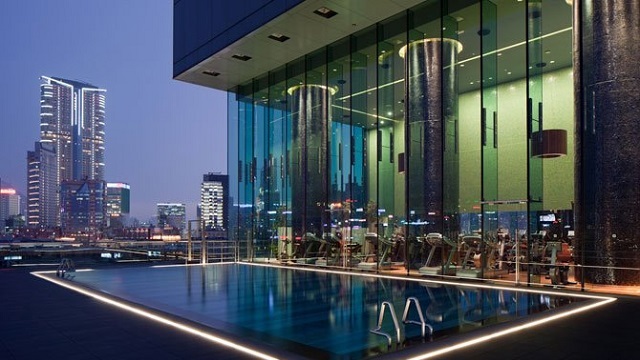 The fitness area continues to offer you an amazing panoramic view of Tsim Sha Tsui while still overlooking the swimming pool. Equip with the latest modern technology you can have a great fitness experience alone or with a personal trainer if needed. 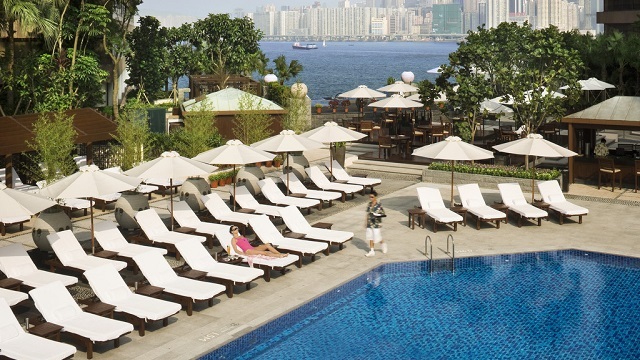 One of the prestigious hotels in Hong Kong is the Intercontinental Hotel has the largest outdoor swimming pool that overlooks the Victoria Harbor. 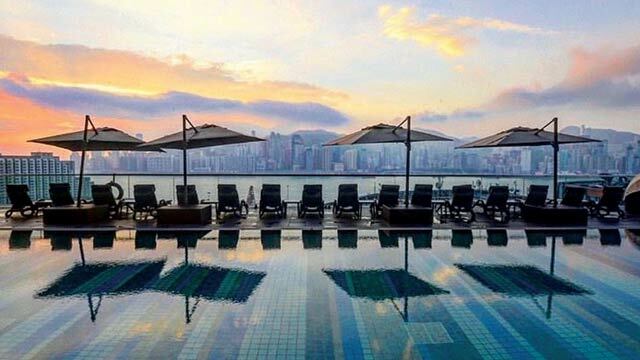 While you enjoy cooling off in one of the three infinity edge swimming pools you can also enjoy the beautiful view of the Hong Kong's famous skyline. 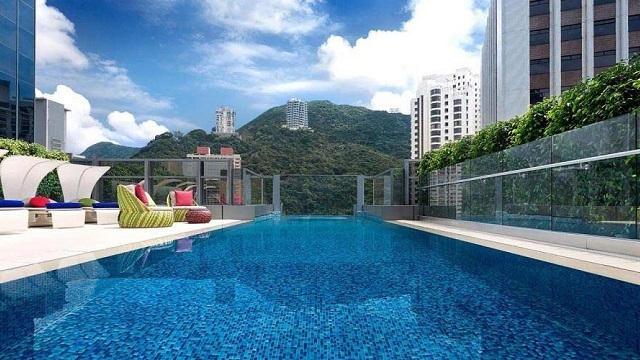 This great view also gives you the feeling like you are swimming in the Victoria Harbor yourself. The tea deck dining area surrounds the pool together with lily ponds. 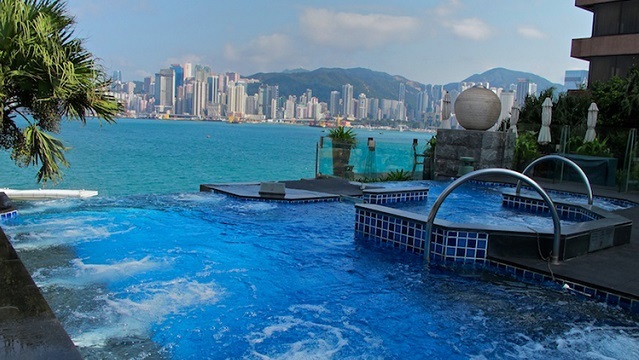 When the evening comes, there is a whirlpool that can help you relax while you watch the Symphony of Lights shows. Unfortunately, this amazing view from the top is only available for hotel guest and can be a bit pricey, but for top service and spectacular views, it is worth it. So, after the hiking trails, ferries to catch, trendy shops to visit, fancy restaurants and clubbing areas the best way to enjoy the epic view of the Hong Kong Skyline is to reach the tops and get away from the entertainment.